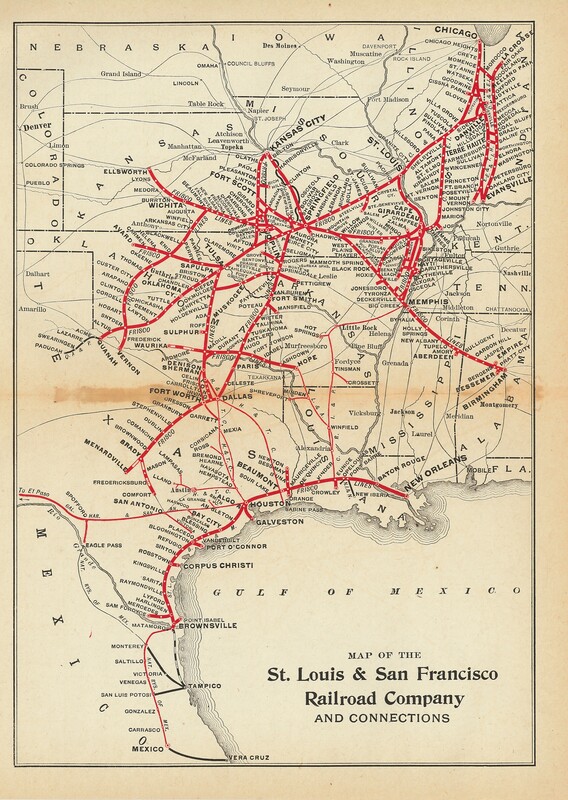 The St. Louis–San Francisco Railway (affectionately known as the “Frisco”) was a St. Louis-based railroad that operated in nine Midwest and southern states from 1876 to 1980. 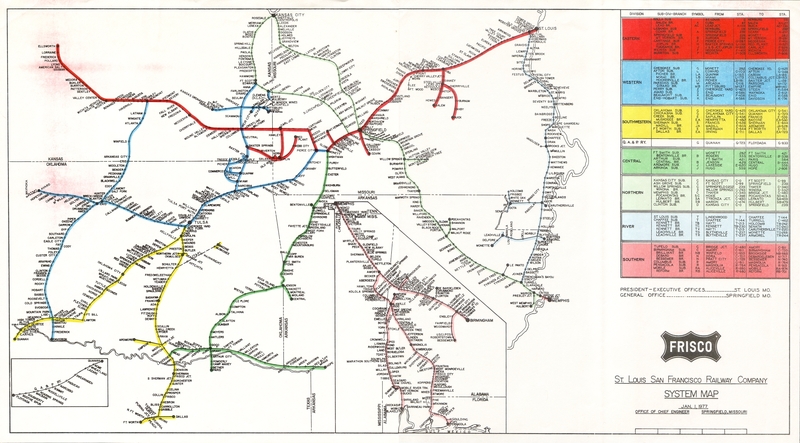 The railroad stretched from Kansas City to Pensacola and St. Louis to Oklahoma City and Dallas, having some of the most iconic motive power, logos and slogans in the history of railroading. 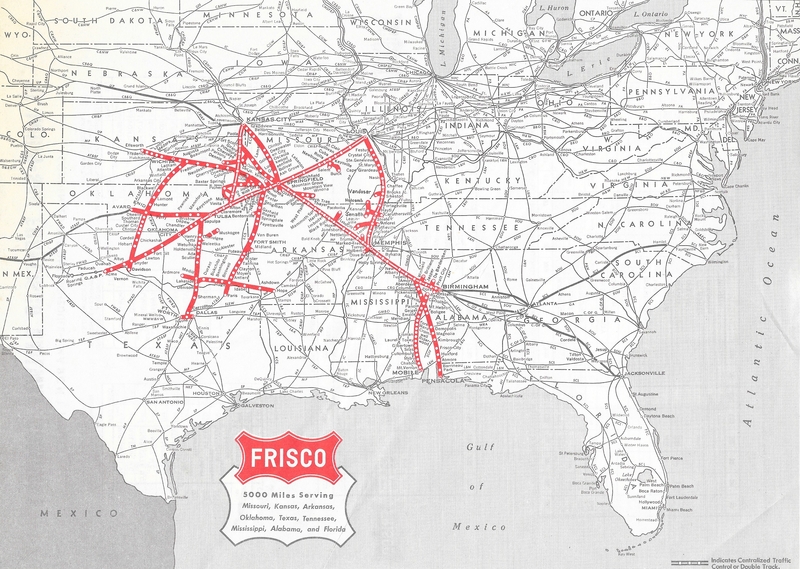 The Frisco was also renowned for excellent passenger service led by some of the best-looking steam locomotives ever built, and celebrated for fast freight hauling behind steam locomotives of its own design as well as diesels in the later era. 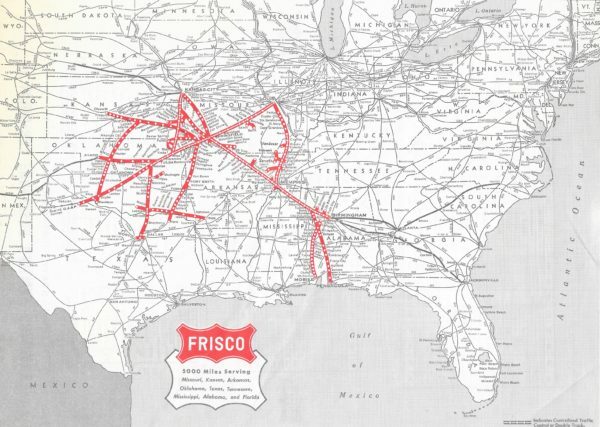 Born as a branch of the great Pacific Railroad project of the mid-19th Century, the Frisco became a separate entity that helped to feed the population of a growing nation, helped build its factories and ship those factories’ products, helped win two World Wars, and helped to carry Americans East and West, North and South in style and comfort. In the 104 years of its separate existence, it became a major corporation that provided the best service possible to its customers while treating its employees like a big family, never losing the homey touch enshrined in its Ozarks-inspired Coonskin logo. 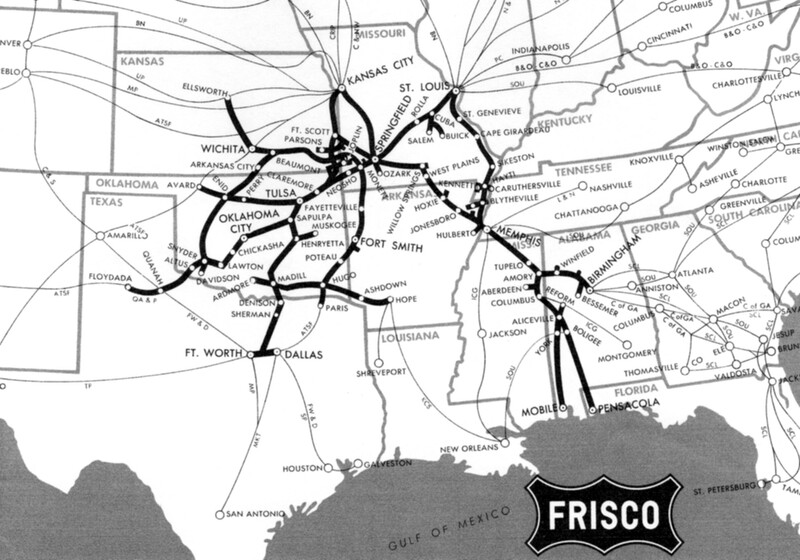 Fiscal responsibility, pragmatic management, and a touch of whimsy combined to make the Frisco a road beloved by all its fans, the Frisco People, those who did business with the road and those who worked for the road, or at least wished they had. 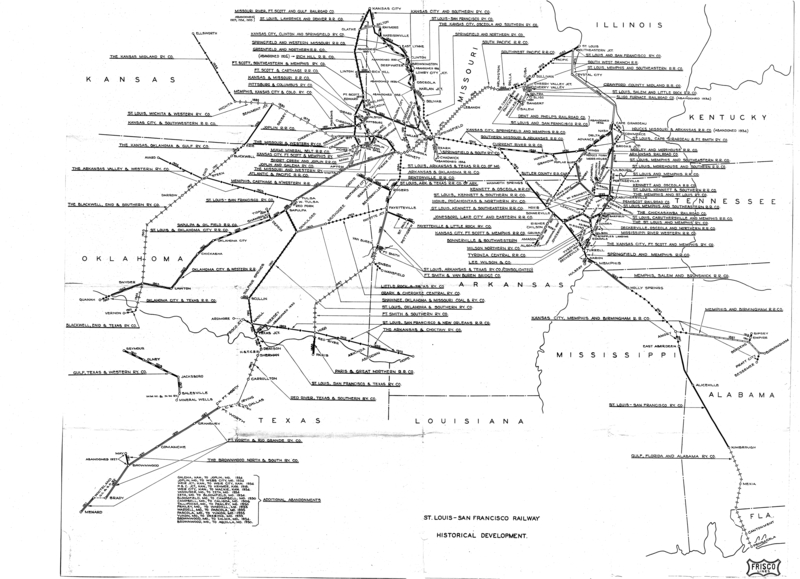 The Frisco merged with, and was assimilated into, the Burlington Northern on November 21, 1980, but most of its lines are still in service today with the BNSF or various short lines. 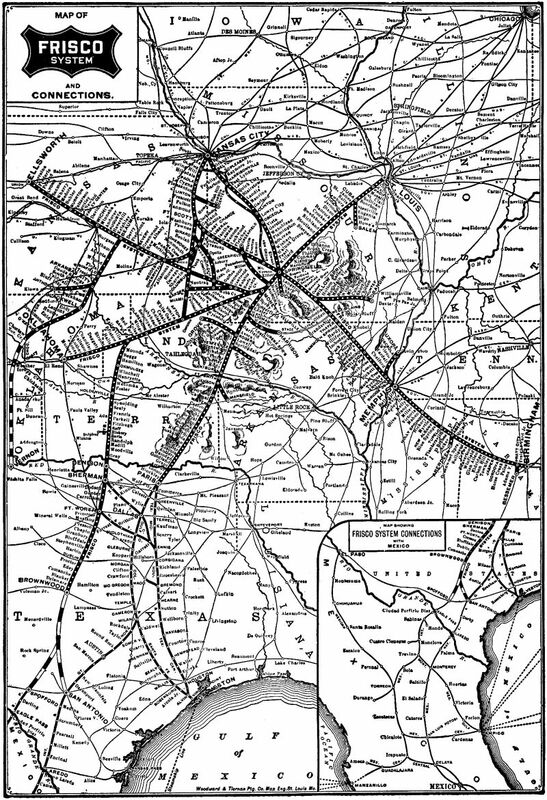 The Frisco discussion forum, with many other resources and fans of the railroad, can be found at www.frisco.org.